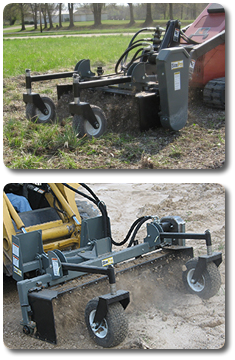 SitePro®'s Power Landscape Rakes are the ideal tool for the landscape contractor, large property owner, rental yard, park & recreation department or turf management professional. They do it all, prep, smooth, set grade, level, till, remove rocks and create the perfect seedbed. View our literature. Offers ability for grading new and existing construction sites.